Wedding Program originally designed by All The Pieces. You already know that we specialize in custom wedding stationery designs. As you prepare for your most special day, here are a few things you might want to consider when you provide us with the inspiration we’ll need to create your “papered wonder”! The Uncommon– Gone are the days when invitations travel the straight and narrow. Invitations now are as elaborate as wedding gowns…okay maybe that’s a bit extreme, but don’t hesitate to include jewels, rhinestones, pearls, or other unique embellishments that will give your invitations pizzazz! Make it Contemporary– One of the most simple things you can do to bring uniqueness to your wedding stationery is to use a font that is daring and bold, a font that speaks volumes to your guests. No need to stick with the classic Edwardian Script, instead opt for a font that does the talking! Get to know the Color Spectrum– Why not incorporate all of the Crayola colors in your wedding stationery? Having a plum and pewter wedding? Use those colors! Doing apple green and fuschia? Yes, use it! 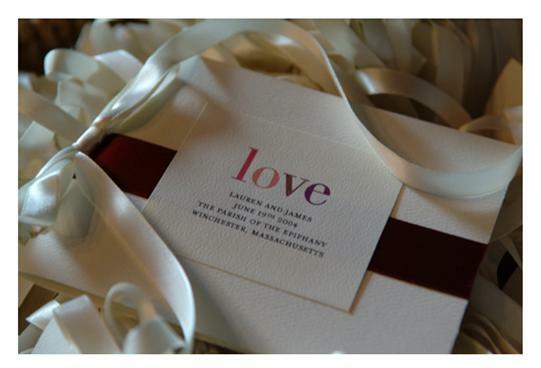 Who says that your wedding invitations must be cream or white? Paper has become just as colorful as fabrics. We might not have the exact match to your swatch, but we guarantee you we can come close to it! It’s Your Name, Use It!– Monograms are making their grand reentrance into stationery. Whether you choose to use the first initials or the first and last initials, brand all of your wedding stationery with a monogram embodies the bond you share with your spouse to be! Do You– If long is better than wide for you, then create a vertical invitation. If you prefer square over rectangle, that’s fine too! Everybody possesses unique traits that belong solely to them and 2009 is the perfect time to incorporate yourself into the design of your wedding stationery. The wedding is all about you, the stationery should be too! Whether you choose to follow these trends or create your own, Papered Wonders, Inc. is poised to serve all of your wedding stationery needs! ← A Papered New Year…2008 in review!